Disclosure is just one component of effective corporate water management. Here we describe the other components and explain how disclosure fits within them. We go on to provide a framework for companies to understand the relative sophistication and maturity of their water management practices and how this informs what water-related topics they are able to report most robustly (and how their practice might expand and evolve in the future). 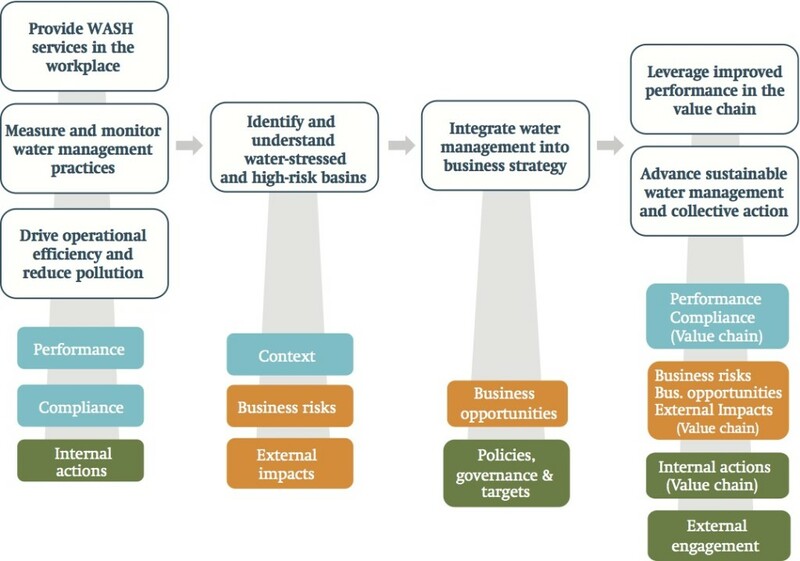 A typical corporate water management cycle features a series of practical steps that a company uses to understand its relationship with water, undertake response strategies, and eventually communicate both to stakeholders. Understanding each step and the type of information generated through this process allows for more effective reporting. Here, we describe how a typical corporate water management cycle aligns with the Disclosure Framework presented in these Guidelines. Though corporate water management processes vary from company to company, they can be generalized as being iterative and having the following fundamental steps. 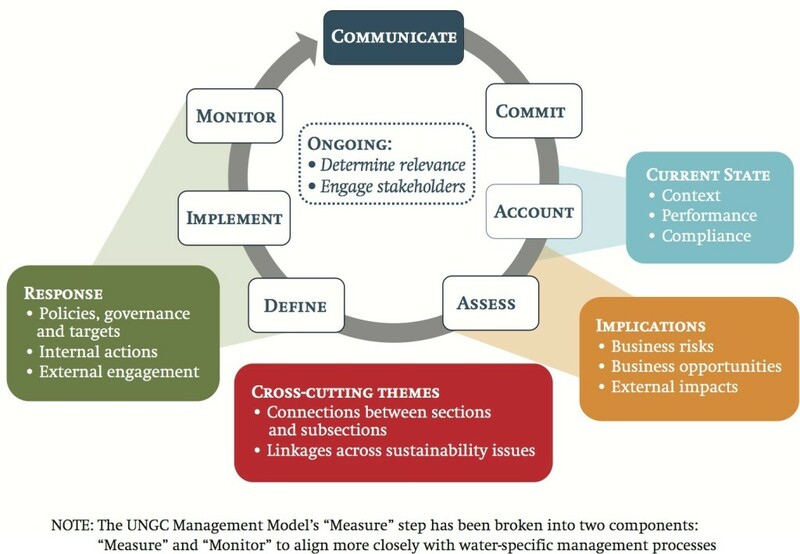 The process depicted below as an illustrative example is derived from the UN Global Compact Management Model  and adapted for water-related management. Commit – Commit to drive sustainable water management. Account – Collect data on internal water performance and the condition of the basins in which the company operates. 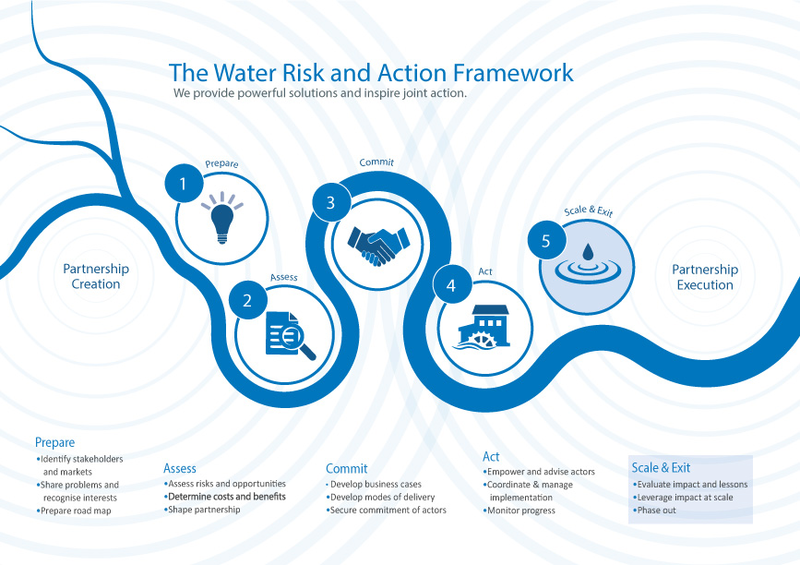 Assess – Use the data generated in the Account phase to identify water-related business risks and opportunities and negative impacts. Define – Define and refine corporate water policy, strategies, and performance targets that drive performance improvements and address risks and negative impacts. Implement – Implement water strategies and policies throughout the company and across the company’s value chain. Monitor – Monitor progress and changes in performance and basin conditions. This process includes two ongoing actions that reinforce each of the seven steps. 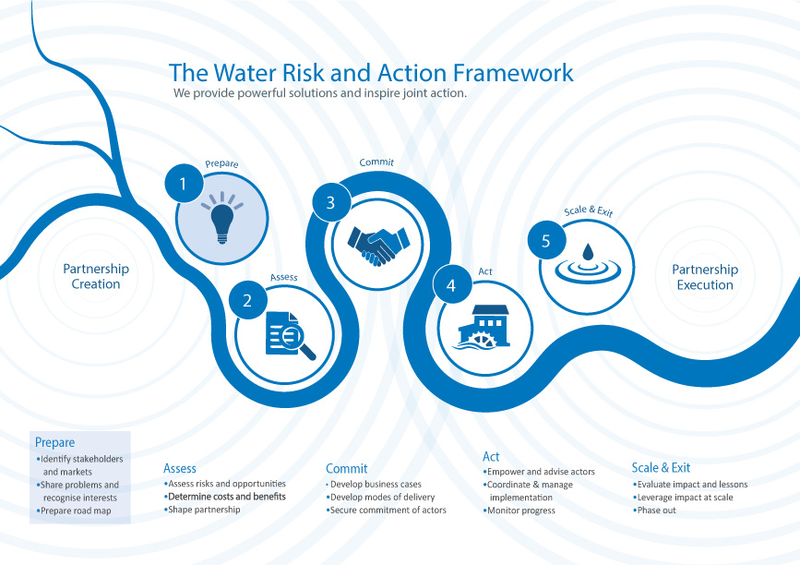 First, a company continually engages with key stakeholders in order to better understand its water-related risks and impacts and receive input on the efficacy of its policies and response strategies. Second, a company continually assesses the relevance of various water-related issues to understand new trends and conditions and identify the issues of highest priority for the business and its stakeholders. This general management cycle includes all the practical and administrative steps needed to generate the disclosure content described in the Disclosure Framework. In the Account phase, companies quantify their internal performance (e.g., withdrawals, water consumption, water discharge) and seek to understand basin conditions (e.g., water availability, water quality) to better understand the current state of their business with respect to water. 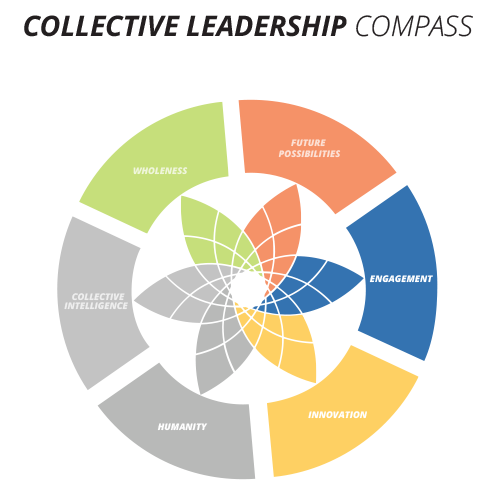 In the Assess phase, companies interpret these data to better understand the implications for business viability (i.e., risks and opportunities) and the well-being of the people and ecosystems that the business touches (i.e., whether there are negative impacts on basin conditions). 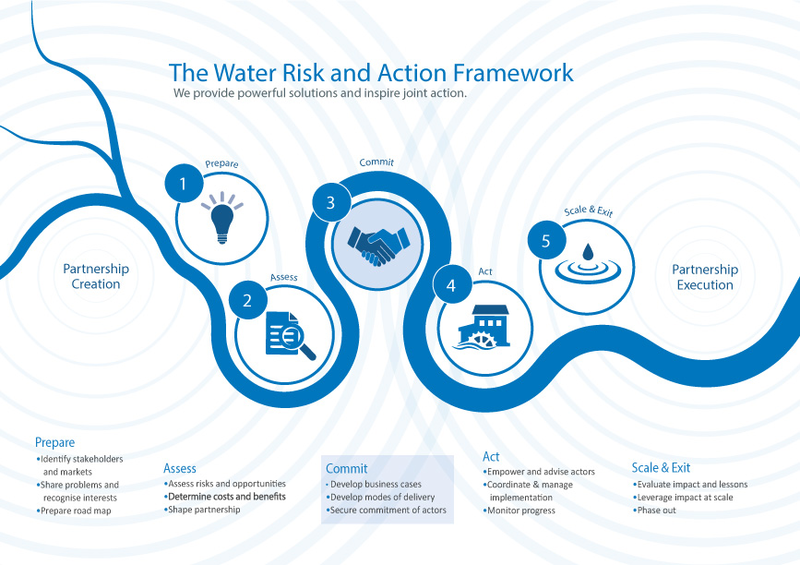 The Define, Implement, and Monitor phases of the management cycle comprise a series of actions whereby companies develop, operationalize, and evaluate response actions (corporate policies and strategies, internal actions, and external engagements) that address their water-related risks and negative impacts. While the management cycle offered in the previous section describes the various practical steps that companies conduct as part of their broader corporate water management processes, it does not speak to how water management practices evolve and mature over the long term. For example, those companies just beginning to prioritize water issues often focus on water measurement and efficiency programs within their direct operations. Those with advanced water management programs might address a wider array of water-related issues such as a comprehensive corporate water strategy, value chain management, and engagement in sustainable water management activities outside the company fenceline. Providing and properly maintaining drinking water, sanitation, and hygiene (WASH) services in the workplace supports the health and well-being of a company’s workers. Another early step is continuously tracking the extent to which direct operations use and affect water resources. Such measurement allows a company to identify facilities (and specific processes within facilities) that require priority action and to gauge progress. A company can build on its understanding of its water management practices by implementing water efficiency and pollution reduction measures that improve its performance and begin to manage its risks and negative impacts. To fully understand and address its business risks and impacts and properly prioritize action among different geographic areas, a company must have a firm understanding of the contexts in which it operates. In particular, it identifies and investigates those areas that are experiencing water stress or might otherwise be considered high-risk. This knowledge is typically gained through internal data collection and assessment and the use of third-party datasets and tools. A nuanced understanding of river basins and the company’s own operations within them positions a company to become strategic about developing policies and programs to address its top water priorities. Comprehensive strategies are integrally linked to core business and long-term business success. 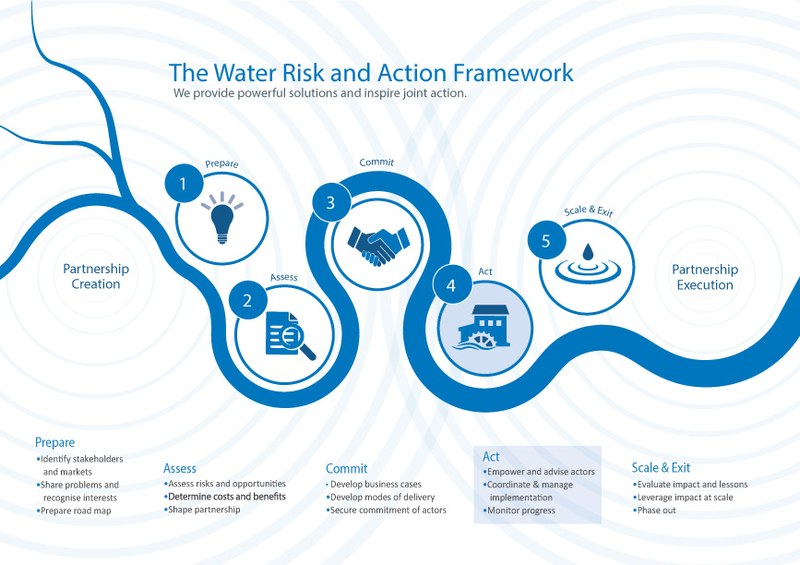 Strategy development can include many dimensions, such as establishing corporate governance and accountability mechanisms, setting goals, and defining a water management philosophy. More mature companies look beyond their direct operations to address water risks and negative impacts in the value chain. 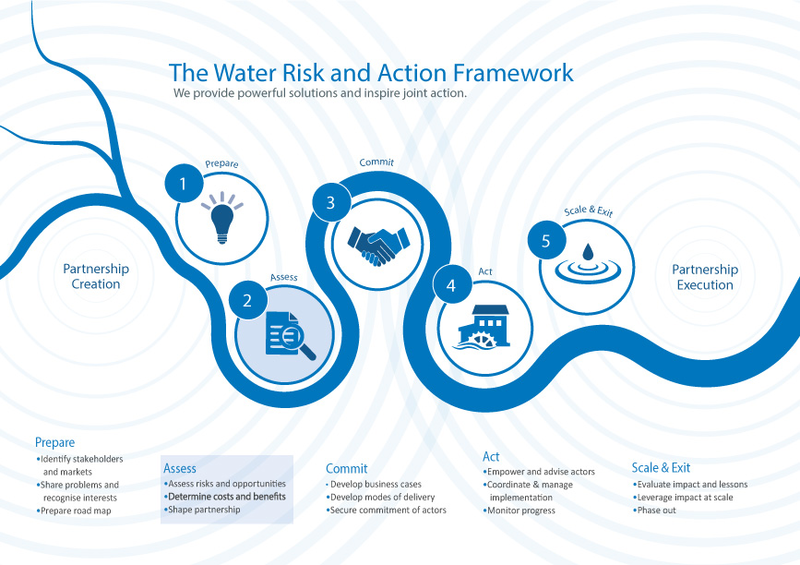 In order to address those risks and opportunities, a company assesses value chain exposure to water risk to consider the impacts its products may have on water resources and how its suppliers are affected by and contribute to water-related challenges. A company then uses its influence to drive improved practices throughout the value chain. A company with the most advanced water management practices may look to engage externally to ensure long-term business continuity by contributing to the sustainable management of shared water resources on which the company relies. Such place-based external engagement occurs in a variety of forms, ranging from information sharing, to community engagement and basin-restoration projects, to working with local and regional governments to strengthen the local water management capacity. 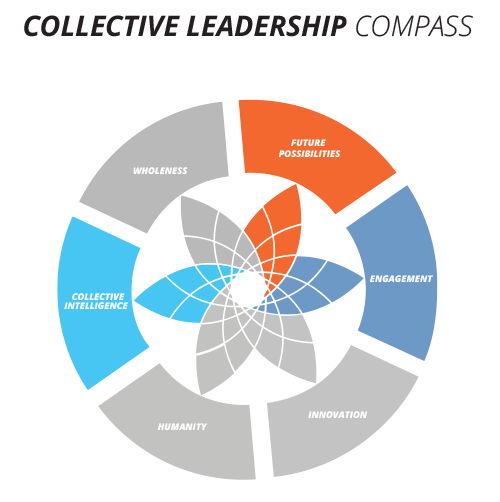 In most cases, this requires collaboration with other organizations and actors (i.e., “collective action”), exposing the company to complex dependencies and increased expectations. Ideally, companies work to advance all seven types of water management activities concurrently. However, due to the complexity of accounting for and managing water and the fact that for many companies water has only recently emerged as a high-priority corporate sustainability issue, many companies currently pursue only one or two activities. Since water management activities differ with respect to time and resource commitments, as well as level of complexity and difficulty, companies tend to pursue them in a similar order (though this can vary from company to company within and among industry sectors). 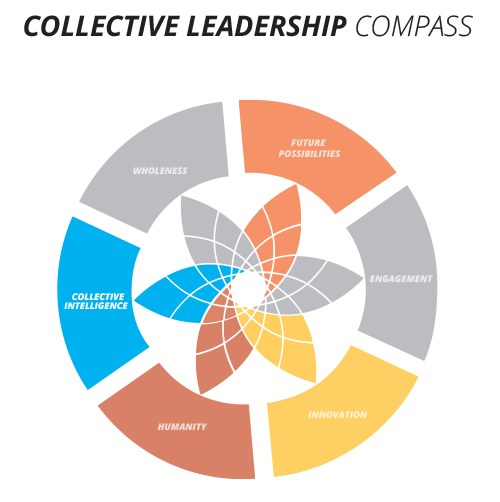 For example, improved operational performance is typically a prerequisite for effective collective action. The maturity of a company’s water management practice is directly related to the maturity and comprehensiveness of its corporate water disclosure. As the company expands its water management activities to address a wider range of risks and impacts, the scope of its disclosure practice expands as well. Thus, if a company identifies where it resides on this progression, it also gains insight into the types of information that it is able to report robustly, as well as how its water management and disclosure practice might expand over time. Figure 3 shows how the types of management activities described above align with and link to the various subsections of the Disclosure Framework.